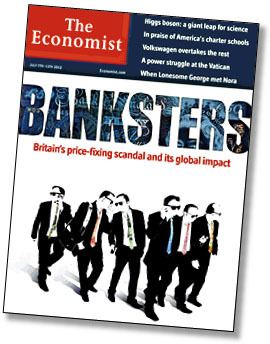 The recent settlement with Barclays Bank over its LIBOR1 fixing fraud has gotten…. some…. attention. Not a lot of attention, though. Why is that, given that this fraud potentially affected trillions of dollars in assets? money. And let’s face it: that doesn’t sound much like widows and pensioners, does it? What’s more, the LIBOR scam wasn’t about pushing LIBOR systematically up or down. Sometimes it was pushed up, sometimes it was pushed down, depending on whatever happened to be good for the Barclays trading desk on any given day. So even if you are a widow or a pensioner with a CD linked to the LIBOR rate, it’s not really clear if you were ever hurt. The attempts to rig LIBOR […] not only betray a culture of casual dishonesty; they set the stage for lawsuits and more regulation right the way round the globe. This could well be global finance’s “tobacco moment”….Despite the risks of banker-bashing, a clean-up is in order, for the banking industry’s credibility is shot, and without trust neither the business nor the clients it serves can prosper. Right now the scandal is limited to Barclays, but that’s just because they decided to cooperate with regulators early on and therefore got keelhauled first. (Also, admittedly, because the Barclays board provided MBA courses of the future with an almost textbook case of how not to handle the news of a gigantic price fixing scandal.) UBS is said to be next in line, and other banks that haven’t cooperated as willingly will take longer to prosecute. In theory, though, the news is likely to be even worse once those cases finish up. Roughly speaking, the view from inside Barclays is that they’re being treated unfairly. They cooperated, after all, and they say that other banks were way more involved in the LIBOR-fixing scam than they were. If that’s true, one of two things will happen. Either this scandal will explode way beyond the financial press, where it’s mostly played out so far. Or it will turn out that declining to cooperate makes it really hard to prosecute the other banks and Barclays will look like idiots for doing so. I’m not sure which to put my money on. 1LIBOR is the London Interbank Offered Rate. It’s basically the current interest rate banks charge each other to borrow money, and it changes on a daily basis. So if you have an adjustable rate mortgage, for example, your interest rate might be LIBOR + 3, or something like that. 2How’s that for a reliable source?